The West Lancs Dementia Hub will launch at the Wellbeing Centre, Moorgate in Ormskirk, on Wednesday 8 May between 2.00 and 4.00 p.m. It will then take place every 3rd Wednesday at the same time and in the same venue. Anyone affected by dementia is welcome. A range of Dementia related service providers and experts will be there to guide and advise those living with dementia and their carers. We will serve free tea/coffee and cake and there will be a speaker, Dr Penny Foulds, who leads the well-established Hub in the Lancaster and Morecambe Bay area. Members may recall that Penny came to speak to our U3A last year, her enthusiasm and positive outlook were infectious. Members of our Textile Group have been making a tablecloth with the Dementia Friendly logo on it and it is hoped that it will be complete and on display on the day. U3A became a ‘Dementia Friend’ last year after an awareness session was held for around 50 group leaders and I have been attending the planning meetings that have led to the Hub initiative. Numbers of local organisations and businesses are supporters too and it is hoped that the Hub will provide a joined-up service for those who need support. We need meeters and greeters at each event so, if you are interested in becoming involved, then do contact me. 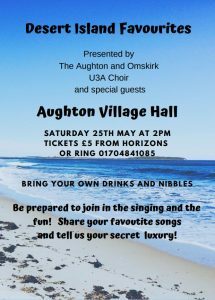 Join our U3A Choir on a Desert Island! Click or tap to view full-size. The U3A catering corps, marshalled by Lily Bunner, certainly know how to keep the troops fed and watered! Here they are providing the same fantastic Horizons service as usual, but in the unfamiliar Ministry Centre, while the Scout building works were in progress. After having a peek at Dee’s career in the recent magazine we are eager to know more, so she has agreed to bring along some pictorial exhibits of her musical life including a short video. We are making this an excuse to have a fun day without keyboards just cakes, chat and bubbly. We realise that other U3A members may wish to meet Dee, so you are invited to drop in and raise a glass to Dee Sheard to thank her for the 14 years of dedication to our Keyboard Music group. Watch a video made for Dee’s 80th birthday in 2011 to celebrate her life with music. So come along to the Gardening Group. Click or tap on any picture to run the gallery as a a slide show. A message from Sue Watkinson about a Guest Visitor that she has organised. Our Guests at Horizons on Thursday 7th March will be two representatives of the Fire & Rescue Service. 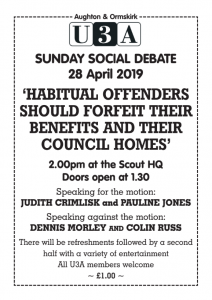 They will bring along their literature and talk to individual members about safety in the home and what services they can offer to the retired population of Lancashire. Recently they replaced a smoke alarm for me. The neighbours were impressed to see a big, red Fire Engine outside the house for a good 20 minutes while the work was done and we were given a thorough Fire Safety check and good advice. I’ve been a member of the U3A for some years now – I attended the German group for a while when it first started and have been to one or two other events, but because of family responsibilities I haven’t been able to commit myself to anything on a regular basis. Things have changed for me now and I look forward to greater involvement and getting to know a few more people. My professional background is in teaching, and my interests range from gardening to all aspects of the arts. Sue will be a hard act to follow I know, and initially I will be scaling things down a little bit so that we will have a speaker every other month. We will be starting on Thursday 7th February with a subject very dear to our hearts – Chocolate! Andrew Thwaite is a former chef who for many years has specialised in the history and manufacture of chocolate, and I’m sure his talk will be just the thing to brighten the dull days of February. Apparently he brings samples as well! Have a look at his website https://www.andrewthwaite.org.uk. Looking forward to Thursday 4th April, we have Carolyn Kirby, who will speak about her new book ‘Victorian Scientists and Scandals: true stories behind The Conviction of Cora Burns‘. Carolyn writes: My novel The Conviction of Cora Burns will be published in the UK and USA in March 2019. This is a historical thriller set in 1880s Birmingham about a troubled young woman, Cora Burns who was born in a gaol and raised in a workhouse. Haunted by memories of a terrible crime, she seeks a new life working as a servant in the house of a scientist, Thomas Jerwood. Here, Cora befriends a young girl, Violet, who seems to be the subject of a living experiment. But is Jerwood also secretly studying Cora? The novel is inspired by some real Victorian lives and events. My talk will give an insight into the research that underlies the fictional narrative of the novel. Looking ahead, I would be very pleased to hear from any members who would like to give a talk, or maybe you remember a past speaker you would like to hear from again. Please email any ideas to speakerteam@aughton-ormskirk-u3a.co.uk or phone 07974 749362. Alan Starkie has issued a message asking for volunteers. Alan is to be found most Thursdays at Horizons at the Digital Camera / Computer Table in the far corner of the Aughton Room in the Scout & Guide HQ. He also is a Helper at Computer Advice on Mondays. There are vacancies on the Finance and Resources Sub-Committee. A background in finance is desirable but not essential. If you are interested in serving on this Sub-Committee or would like more information then please contact Alan Starkie. Many rumours are flying about the U3A at the moment with a view to what is happening with the magazine distribution. Let me try and answer some of them. The next Distribution date is the 28th February, and nothing will change at this time, magazines can still be collected from Horizons and from certain group leaders who already hand magazines out at their groups. Magazines will also still be posted out on this occasion. The changes will be made on the subsequent distribution days. On these days, each new magazine will initially be available for collection at Horizons, and there will be a distribution desk at the following three Horizons. This provides four weekly opportunities to collect your magazine each time. Hand deliveries will continue for as long as the volunteers wish to carry them out. I would like to wholeheartedly thank all the volunteers who already give up their time to make this process work. I do now need to ask if there is anyone who is willing to take on the distribution role as I am looking to step down from this post due to other U3A commitments. If anyone is willing could you please get in touch with a member of the Management Committee or me. I would be quite willing to work alongside a new distribution manager for several copies. A fuller explanation will appear in the next magazine. Church History Group is starting a new Series on Medieval Cathedrals in January. Keep an eye on the Church History Group Page for details of these ever-popular Talks (and a Cathedral Visit). We have had an approach from Barry James, the leader of Cannock Chase U3A Science & Technology group in the West Midlands region. He is proposing a Robot Constructor’s Challenge, open to any U3A team who would like to construct a moving robot type device; he says that this would be interesting to technology or construction groups who may like to do something practical, and then come together to see how their constructions compete against each other. He has the support of the National and Midland Regional U3A in this venture. Are there any mechanical or electrical constructors in our U3A who’d like to build a robot capable of moving and being controlled? You may have heard of “Raspberry Pi”, “Arduino” or “Picaxe”, which are all programmable devices, and will aid the use of sensors on robot devices so the challenge will clearly be of interest to coding creators too. If successful the robot would be demonstrated and compete with those of other U3As, undertaking some simple challenges at Aston University in Birmingham where the U3A Science Network is holding its annual meeting in August 2019. It is also hoped that a visit to the School of Engineering & Applied Science Robotics department will be included. British History is a brand new Group, starting on 7 January, in which you can learn anew or refresh your memories about the fascinating History of our homeland from the Norman Conquest till the reign of Victoria. See the new British History Group Page for full details. On Nov. 28th Christmas came early to U3A’s German Conversation group. The final class of 2018 was organised around a theme of “Christmas in Germany” and to add to the occasion, spouses and partners had been invited to join us. The group was greeted cheerfully with glasses of warm “Glühwein” and “Häppchen”- German nibbles. Having been put in the mood, we settled down to a series of quizzes arranged around our summer out of class activities and intended to test our memories and the German we have learnt this year. This was followed by an extended break when two long, tastefully decorated tables to match the Christmas Theme, were liberally covered with typical German delicacies and liquid refreshments. After the break the group were entertained by a three handed comic sketch built around the concept of guests arriving at what they thought was a typical German Gasthof only to find the proprietor practised an Alternative Style of Living. As the prospective guests were shown around they discovered to their horror, that they were expected to dine in the bathroom; sleep in the kitchen and bathe in the lounge! What strange ideas some people do have. Needless to say the prospective guests decided not to stay there and promptly left. The class ended with the hearty singing of the German Christmas songs “O Tannenbaum” (The Fir Tree), “Stille Nacht” (“Silent Night”) and “Still, still, still” (the same in both German and English) accompanied by recordings of German choirs. Everyone had an enjoyable time and the class ended with a show of appreciation to Joan, Joyce and Norma in the traditional manner. This class is for anyone who fancies learning to tap-dance and is suitable for those who have had no tap-dancing experience. It will deliver the basic tap-dance steps at a pace which will suit the individual. It will be held at Aughton Women’s Institute (newly refurbished) on Town Green Lane. You do not need tap shoes but you do need some comfortable flexible-soled shoes (not trainers). The Shakespeare Revisited group closed for a while last year. However, there is now a new group leader, Eila Wall and the group is starting again in the New Year. The first meeting is on Tuesday 8th January 2019 from 2pm to 4pm and will meet in the upstairs room at the Ministry Centre. All former members will be very welcome, as is anyone who has an interest in Shakespeare. Don’t worry if Shakespeare is a distant memory – no previous knowledge is required. If you think you might want to join the group or find out more, please phone Eila Wall on 01695 423341 at any time prior to the first meeting. Paula Gatterall from West Lancs Borough Council is running a FREE weight management programme and attended Horizons as Guest Visitor on Thursday 13 December to talk to members about this. The programme will be held in the Christ Church Ministry Centre starting in January 2019. The meetings are on Thursday mornings, so handily timed to combine with a visit to Horizons beforehand!